Your AdWords landing page is your key chance to convince the customer to convert – to buy your product, fill out a form or download a resource. You need high-quality landing pages to optimize conversion rates, and highly relevant pages will also lower your conversion costs. Creating specific landing pages that speak directly to the user's search query will have a positive impact on your AdWords account and, most importantly, drive more conversions. It’s worth it to devote major time and effort to optimizing your AdWords landing pages. You can’t build landing pages in AdWords: Landing pages are what bring the PPC process full circle – you can’t have great AdWords ads without solid landing pages, plain and simple. And yet, Google offers no landing page assistance (outside of a few tips) within AdWords. You’re flying solo and we’re entering unrestricted air space! Landing pages usually require outside help: Creating landing pages generally requires a developer to edit and manage the pages, a graphic designer to design the pages, and a hosting environment. That means major time and money. AdWords landing pages have specific requirements: A successful landing page has many different elements to consider – your landing pages need to be relevant to your keyword and ads in order to earn good Quality Score. You also need to have conversion tracking properly set up to track what is and is not working. That’s a lot to keep track of! Luckily, WordStream makes it easy to create beautiful, highly-optimized landing pages without hiring an entire IT team. WordStream’s Landing Pages & Leads tool lets you create gorgeous custom landing pages with our easy-to-use page wizard, while collecting and organizing data about your leads so you know exactly who is visiting your pages and what offers they take advantage of. It’s a Complete PPC Solution: Together, the WordStream Advisor Tool, which helps advertisers craft expert AdWords ads and manage keywords, coupled with the Landing Pages & Leads tool, brings the PPC process full circle. Create your targeted keyword ads with relevant, lead-delivering landing pages in one seamless environment. It’s Easy, Breezy, and Beautiful: The Landing Pages & Leads tool provides a step-by-step wizard that leads you through the process of creating, designing editing, and publishing your landing pages without getting IT involved. It’s Designed with PPC In Mind: PPC landing page best practices are baked into the Landing Pages & Leads tool. We will make sure you include those snazzy call-to-action buttons, thank you pages, solid form fields, and more, so that you never miss a beat. The Landing Page Builder has an intuitive point-and-click interface that helps walk you through the process of creating a good-looking, conversion-optimized landing page that will rake in the leads. We’ll briefly take you through the builder tool so you can see how things work. 1. Select Your AdWords Landing Page Theme: Choose your color palette, company logo, and a main image for your landing page. The tool also provides a live preview in the sidebar so you can see the changes you’re making as they occur. Focus on a powerful headline: Your headline is the most important aspect of your copy – in fact, it’s the only part some visitors will even read! Make it count. Write clear, concise copy: Your copy should be pushing the benefits of your offer. Implement bullet lists, bold text, and other visual elements: This helps readers understand what parts of your copy are the most important and makes the copy easier to digest. Remember, you want visitors to be doing less reading and more form filling! 3. Landing Page Form Builder: Your form collects key data from users. Along with the headline, it’s one of the most important elements of your AdWords landing page. A well-optimized form can have tremendous affect on your conversion rates. Form Fields: Choose your form fields – you can include standard fields like name, phone number, email, job titles, etc, along with custom fields like text fields, dropdown menus, or checkboxes. Call to Action Button: Forgetting to customize the call-to-action button is a common misstep for those new to landing page design. Deviating from the common button text like “Go” or “Submit,” and opting for your own custom text that specifically relates to your offer (such as “Get Your Ebook Now” or “Download Templates”) can greatly improve conversions. Thank You Page: The thank you page is where users are taken after clicking your call to action button. The landing page creator lets you upload assets like white papers or ebooks. The landing page creator tool also lets you paste in a conversion code so that you can easily track form completes. 4. AdWords Landing Page Settings: Adjust landing page settings like your URL, analytics code (for tracking traffic to your page), and your AdWords landing page footer that can include a link to your company home page, among others. AdWords landing page optimization is as simple as a few clicks. Did you know half of all AdWords accounts don’t even have conversion tracking set up? Yikes! Conversion tracking is absolutely essential for AdWords landing page testing and discovering what’s working and what isn’t on your pages. Get detailed tracking information for deep insight and understanding into which keywords and which landing pages are driving the best results. Check your landing page conversion rates to measure the performance of your AdWords landing page. Export all lead data so you can use the data however you’d like. No secrets here! Create and design landing pages optimized for AdWords with ease. The design wizard cuts down on time, letting you craft lead-driving landing pages without hiring a team of outside help. Get help from baked-in best practices, which key you in to landing page guru tips. Better landing pages mean more form completes, more measurable data, and better Quality Scores. Track and manage leads with conversion tracking so you can measure performance and success markers. Manage all PPC moving parts from one centralized spot. WordStream Advisor helps you build great AdWords ads, organize and discover new keywords, and design lead-obtaining effective landing pages all in one place. Check out WordStream’s Landing Page & Leads tool today – sign up for a free trial! The AdWords Landing Page Performance Grader is packed with valuable info that will help boost your conversion rates and make sure your landing pages are set for optimal performance. 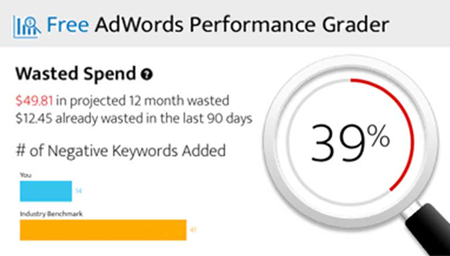 Best of all, the AdWords Landing Page Performance Grader is 100% free! Try it today!